This pool table popped in fully formed. It's unusual but not unheard of. Cosmic flotsam drifts into place sometimes. Where it came from is an interesting line of inquiry. It could be an extant pool table, one that had a definitive spacetime locale. An eddy of the universe then picked it up, carried it, and deposited it here. 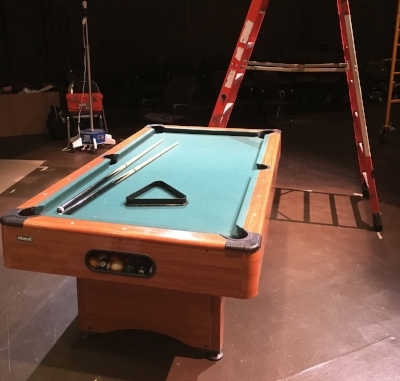 It could also be an archetypal pool table, a theoretical form that dropped into being at this indefinite point, this thin spot. Pictured here below a ladder used for hanging ideas above people's heads. No, only kidding - it's for hanging spare dark matter. It came to rest next to one of our crew ladders. The techs have been using it on their breaks. It's been a good way to unwind a little and work off the tension one naturally builds up when structuring pockets of something in a far corner of nothing. And yes, I was using 'pocket' and 'corner' in a punnish manner. That's another good way to unwind.